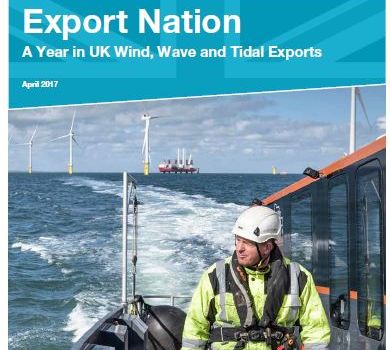 A new report published this week by UK trade body RenewableUK shows that the country’s wind, wave, and tidal energy sectors are exporting their goods and services to the world on a massive scale, highlighting the growing importance of these technologies and the potential windfalls for the UK if the Government bets heavily on these industries. The UK is a well-known leader in wind, wave, and tidal energy technologies. The UK’s current onshore operational wind capacity sits at just under 10 gigawatts (GW), while its offshore wind capacity sits at 5 GW, adding up to a total operational capacity of 14,756 GW. While the UK’s nascent wave and tidal energy industries are only just getting off the ground, they are nevertheless farther ahead than almost every other country, and some experts predict that wave and tidal stream energy could together deliver around 20% of the UK’s current electricity needs, or around 30 to 50 GW. So it should come as no real surprise, then, that the UK’s wind, wave, and tidal energy industries are increasingly sought after globally. 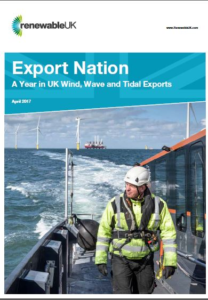 The new report, Export Nation: A Year in UK Wind, Wave and Tidal Exports, published this week by the UK’s wind, wave, and tidal energy trade body, RenewableUK, shows that an illustrative sample of 36 UK-based firms in 2016 signed more than 500 contracts to work on renewable energy projects in 43 countries across Africa, Asia, North and South America, Europe, and Australasia. Further, the sampled projects ranged in value from £50,000 up to £30 million each. The top 10 most frequent export destinations in 2016 for UK-based wind and marine energy companies, in order of importance, were Germany, the USA, Denmark, Ireland, Australia, Canada, Sweden, France, Singapore, and Taiwan. The report serves simply as an example of the larger industry, representing only 36 companies, which represents less than 10% of RenewableUK’s membership. “The UK’s wind, wave and tidal energy exports are great British success stories on the international stage,” said RenewableUK’s Executive Director Emma Pinchbeck. “Our businesses are securing hundreds of contracts, worth millions of pounds, across six continents. Our leadership in this $290bn renewables marketplace will be even more important as we leave the EU.